This is a site about keeping and caring for aquatic turtles, which are turtles that live near and spend a lot of time in the water. It's intended for people who like turtles and want to learn how to keep them as pets or as a hobby. I have tried to keep the language and tone simple and lively, while still providing good, useful information about aquatic turtle care. I also have tried to provide the most important information that someone new to the hobby needs to know, along with links to more advanced information about keeping turtles. Some of the information is very basic, such as how to set up your turtle tank. 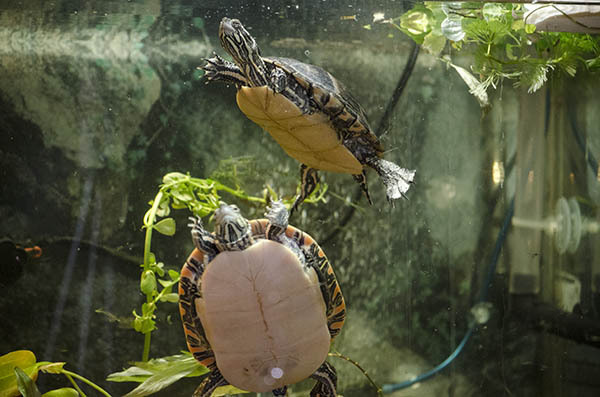 Other information is more advanced, such as how to maintain the water quality in a turtle tank, turtle respiratory infections, and how to care for a gravid turtle (a female who needs to lay eggs or is "pregnant"). There's also information about turtle tank filters, proper turtle lighting, and using live plants in your turtle tank if that's something you're thinking about. As you continue to care for your turtles, you'll want to learn more and more about them. In fact, as you grow to appreciate these fascinating animals more and more, you may find yourself becoming an amateur herpetologist. (That's a scientist who studies reptiles and amphibians.) There are many good books about aquatic turtle care available to help you advance in the hobby. This site also features a video feed of a turtle tank here in my office. It doesn't always work because sometimes the Internet connection goes down, and sometimes the camera and server that run the feed need maintenance. When this happens, you'll usually see cached (pre-recorded) video instead of the live feed. But most of the time, you should be able to watch the turtle just by clicking here or on the link on the left menu. This site won't tell you everything you need to know about keeping aquatic turtles. Turtles are very complex animals, and learning to care for them can take a lifetime. Instead, this site provides the most important information that someone new to the turtle hobby needs to know, as well as links to sites where you can find more advanced information. There are a lot of turtle sites on the Internet, so why do we need another one? Well, many of the turtle information sites on the Web were written for young children, using baby talk and cartoon pictures, and don't contain very much useful information about keeping turtles. Other sites were written for people who were already turtle experts and wanted to discuss advanced topics of turtle care, but the information can be confusing for beginners. That my visitors are new to the turtle hobby. They either are planning to get their first turtle or just got one, and they need basic information quickly. That they want to learn good turtle husbandry (which means raising and caring for animals, in this case, turtles). That they will be raising their turtle indoors, in an aquarium tank or aquatic turtle habitat. Many people raise turtles in outdoor ponds, but I think using a tank is easier for beginners. The turtles who originally appeared on this site's video feed were purchased especially for this site in February of 2004 when they were hatchlings. ("Hatchlings" are what "baby turtles" are called.) Those turtles have grown up and are adults now. They outgrew the tank that I use for the video feed and stopped getting along, so they were moved to separate, bigger habitats. The turtle in the video feed now hatched in December of 2015. It is a Southern Painted Turtle (Chrysemys picta dorsalis). There used to be another turtle in the tank, but they started fighting and one had to be moved to another habitat. Southern Painted Turtles are hardy and relatively easy to care for. They have very pleasant, funny personalities and quickly learn to recognize their keepers and other family members. They're very animated (that is, they move around a lot). They're hyper and they love to swim and explore, so they're very interesting to watch. Southern Painted Turtles are among the smallest aquatic turtles, so they don't need quite so big a habitat when they grow up. Male (boy) Southern Painted Turtles grow to about five inches (about 13 centimeters), and females (girls) can grow to about seven inches (about 18 centimeters). That makes them the smallest of the painted turtles, and one of the smallest of the aquatic turtles in North America. Southern Painted Turtles are very pretty. They're called "painted turtles" because of their coloration, which looks like someone painted them with an artist's brush. I hope you enjoy this site and learn from it. Turtles are beautiful, fascinating creatures, and keeping turtles is a wonderful hobby that can provide a lifetime of enjoyment and education.